1932 – Learns Chinese Fist of Chakuriki in the land of Manchuria. He was 9 years old. 1938 – Started training in Goju Ryu and Shotokan Karate extensively. 1946 – Started solitary mountain training for 14 months. 1947 – Became the champion of All Japan Karate-do Tournament. 1948 – Went into the mountain for solitary training again, this time for 18 months. 1950 – Started training with live bulls. Fought more than 50 bulls, quite a few were killed by his bare hands. 1952 – Visited America for Karate demonstrations in 32 locations and accepted challenges. 1953 – Fought against a bull in Chicago, where he broke it’s horn by Shuto Uchi (knife hand strike). 1955 – Travelled around South America and Europe. He fought numerous challengers. 1956 – Established Oyama Dojo, his first Dojo within an old ballet studio. 1957 – Style was officially named Kyokushin, Kyokushin Karate was born. 1958 – Published “What is Karate” which became a best seller with 500,000 copies sold. Invited by FBI in Washington D.C. for Karate demonstrations. 1964 – Muay Thai challenged Karate-do, and Oyama Dojo accepted the challenge. Won 2 out of 3 matches. 1971 – Through a popular comic “Karate Baka Ichidai,” and the movie “World’s Strongest Karate” in 1975, his name and Kyokushin become known all over Japan. 1975 – Kyokushin Karate’s 1st World Open Knockdown Tournament was held in Tokyo, Japan. 1990 – Kyokushin Karate memberships exceeds 10 million worldwide. 1994 – April 26, died of lung cancer at the age of 70. Kyokushin Karate’s Sōsai 総裁 (President), Masutatsu Oyama, was born by the name of Yong-I-Choi in Qa-Ryong-Ri Yong-chi-Myo’n Chul Na Do, a village not far away from Gunsan in South Korea on 27th July,1923. He was the fourth son of Sun Hyung in a family of 6 boys and 1 girl. At a young age Yong-I-Choi moved to live with his sister who lived on a farm in Manchuria, a place in Southern China. He had his first encounter with Martial Arts when he was about 9 years old. He started to learn the Southern Chinese form of Kenpo also known as the ‘Eighteen Hands’. His teacher was Mr. Yi who at that time worked on the farm of his sister. Yong-I-Choi trained with Mr. Yi for about 2 years and reached the level of shodan 初段. When he was twelve he decided to return to Korea but kept his interest in martial arts. He started his training in the Korean martial arts of Taiken or Chabi. This sport was a mixture of different arts like Kempo , Kung Fu and Jujitsu. In March 1938, when he was 15 years old, Yong-I-Choi left for Japan to enrol in the Imperial Japanese Army’s Yamanashi Aviation School. While living in Japan he was forced to choose a Japanese name so he decided to take on the name of Masutatsu Oyama (大山 倍達), meaning Great Mountain. In September, Oyama became a student of Gichin Funakoshi, founder of Shotokan Karate 松濤館流. Funakoshi, a teacher from Okinawa, was credited with introducing karate to Japan. It is this man the Oyama would later refer to as his true karate teacher. Oyama always spoke highly of Funakoshi, and to say the of the many things he learned from Funakoshi, Kata (Choreographed Forms) was the most important. His training progress was such that by the age of seventeen he was already a Nidan 二段 (2nd Dan), and by the time he entered the Japanese Imperial Army at 20, he was a Yondan 四段 (4th Dan). At this point he also took a serious interest in Judo 柔道, and his progress there was no less amazing, in less than four years he achieved the rank of Yondan in Judo as well. After the end of World War II, Mas Oyama began training under Nei-Chu So, in Goju Ryu Karate 剛柔流, an Okinawan karate style. Gogen Yamaguchi, nicknamed “The Cat”, was carrying on Goju-Ryu, founded by Chojun Miyagi in 1930 in Japan. Yamaguchi commonly acknowledged that Nei-Chu So was one of his best students. Master So, renowned for the power of his body as well as his spiritual insight, encouraged Mas Oyama to dedicate his life to Budo 武道, the Martial Way. Around the time he also went around Tokyo getting in fights with the U.S. Military Police. He later reminisced those times in a television interview, “Itsumitemo Haran Banjyo” (Nihon Television), “I lost many friends during the war- the very morning of their departure as Kamikaze pilots, we had breakfast together and in the evening their seats were empty. After the war ended, I was angry- so I fought as many U.S. Military as I can, until my portrait was all over the police station.” At this time, Mr. So suggested that Oyama retreat from civilization for three years to train his mind and body without the distractions of the outside world. It was during this time he also met Eji Yoshikawa, author of the novel Musashi 武蔵, which was based on the life and exploits of Miyamoto Musashi, Japan’s most famous Samurai warrior. Both the novel and the author helped him understand the true meaning of Bushidō 武士道, the Way of the Warrior. That same year, Mas Oyama went to Mt. Minobu in Chiba Prefecture, where Musashi had developed his style of sword fighting. Mas Oyama thought that this would be the most appropriate place to begin the rigorous training he had planned for himself. Accompanied by a student, he went into the wilderness there to train, with a friend bringing food supplies to them once a month. Among the things he took with him was a copy of Yoshikawa’s book. Oyama built a shack on the side of the mountain. One of his students named Yashiro accompanied him, but after the rigorous isolated training, with no modern conveniences, the student sneaked away one night, and left Oyama alone. With only monthly visits from a friend in the town of Tateyama in Chiba Prefecture, the loneliness and harsh training became gruelling Oyama began to doubt his decision, so he sent a letter to the man who suggested the retreat. Mr. So replied with encouragement to remain, and suggested that he shave off one eyebrow so that he would not be tempted to come out of the mountain and let anyone see him that way. Oyama remained on the mountain for fourteen months, and returned to Tokyo a much stronger and powerful Karateka. A few months later, in 1947, Mas Oyama won the karate section of the first Japanese National Martial Arts Championships. However, he still felt empty for not having completed the three years of solitude. He then decided to dedicate his life completely to karate-do. So he started again, this time on Mt. Kiyozumi, also in Chiba Prefecture. This site he chose for its spiritually uplifting environment. His training was very intense and rigorous. He trained for about 12 hours a day .He trained standing below icy cold waterfalls, breaking river stones, using tree’s as his makiwara 巻藁 (striking boards), jumping hundreds of times over fast growing branches. He also spent hours studying ancients classics on the Martial arts, Zen, and philosophy. He meditated during long hours in the icy waterfalls. His goal was to create a martial art going back to the origins of the true samurai way of fighing. During these 18 months of rough and intense training, Mas Oyama combined the most effective techniques of different systems and made up his own unique style. After this time he returned back to society as a completely different man. Much mentally, physically and spiritual stronger than before. To this day, there is no other person who has undertaken such a training regimen within the martial arts world. After this second isolation and training period, Oyama returned to civilization ready to apply all that he had learned. It was at this time he decided to apply his karate expertise in a life and death battle – a conflict that would set man against beast. Mas Oyama, in order to show the strength of his karate, tested his strength by fighting raging bulls bare-handed. In all, he fought 52 bulls, three of which were killed instantly, and 49 had their horns taken off with Shuto Uchi 手刀 (knife hand strikes). That it is not to say that it was all that easy for him. Oyama was fond of remembering that his first attempt just resulted in an angry bull. In 1957, at the age of 34, he was nearly killed in Mexico when a bull got some of his own back and gored him. Oyama somehow managed to pull the bull off and break off his horn. He was bedridden for 6 months while he recovered from the incident. Today of course, the animal rights groups would have something to say about these demonstrations, despite the fact that the animals were all destined for slaughter. In April 1952 Mas Oyama travelled to the United States where he stayed for one year demonstrating his karate live on national television. He fought against professional boxers, wrestlers and everybody who wanted to challenge him. In total he fought against 270 opponents and defeated them all, most of them with a single attack. No fight lasted longer than 3 minutes and most were finished after a few seconds. Oyama based his fights on the samurai fighting principle of Ichi Geki, Hissatsu 一撃必殺移動 (one strike, certain death). If he got through to you, than the fight was over, if he hit you, something will break, if you don’t block his strikes your ribs will break, even if you manage to block, the result would be a broken or dislocated arm. Due to his power he was known as ‘God’s Hand’. To him, this is karate. The fancy footwork and intricate techniques were secondary, he was also known for his powerful head kicks. Practitioners of other styles came to train here too, for the jis-sen kumite 実戦組手 (full contact fighting). Mas Oyama would observe those from other styles and adopt any techniques that would be useful in a fight. 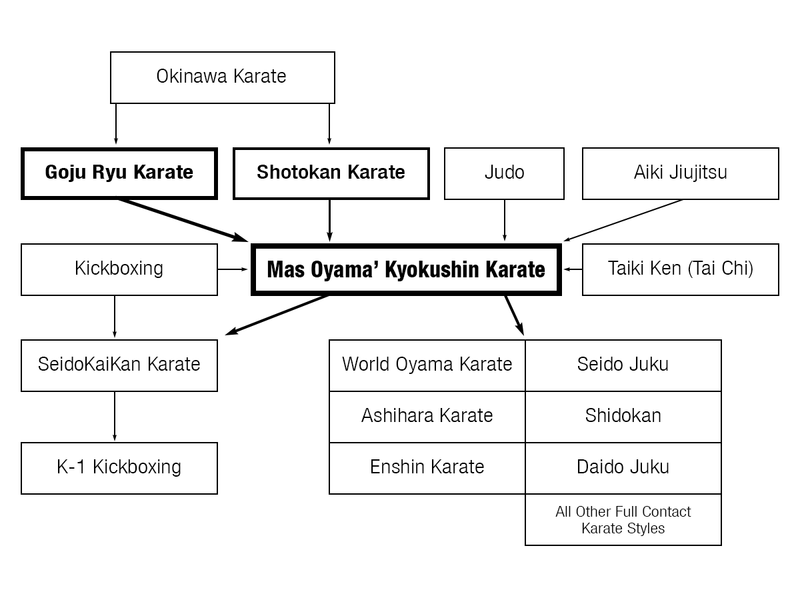 This was how Mas Oyama’s karate evolved. He took techniques from all martial arts, and did not restrict himself to karate alone. By doing so, Kyokushin Karate evolved into one of the most formidable style of martial arts in the world. It soon became known as “The Strongest Karate”, not only because of the incredible feats of strength and endurance that Mas Oyama performed, but also because of the rigorous requirements of the training and tournaments. In order to test his own abilities, Mas Oyama decided to perform a 300 Man Kumite 三百人組手 (San-Byakunin Kumite) over the period of three days. He chose the strongest fighters in his dojo to fight him one after another. After each had a turn, they started from the beginning again until all three hundred fights were completed. Each student had to face Mas Oyama about four times over the three days, though some never made it past the first day due to Oyama’s powerful blows. He defeated all of his opponents, never wavering in his resolve, despite the fact that he was injured in the process. Legend has it that Mas Oyama was willing to go for a fourth day, but no opponents were willing or able to do so. In June 1964 the actual Honbu (world headquarters) was officially opened and IKO (international Karate Organization) adopted the name of “Kyokushin”, or “ultimate truth” as the name for Oyama’s karate. From that moment Kyokushin Karate started to spread out all over the world attaining over 15 million practitioners in over 120 country’s, making it in one of the biggest martial arts organizations in the world. In 1974 Mas Oyama got honored for his work by receiving the 9th dan and shortly after that he received the 10th dan, the highest possible grad in the world by the international committee of counry representatives. Sadly, Mas Oyama (a non-smoker) died of lung cancer in 1994. 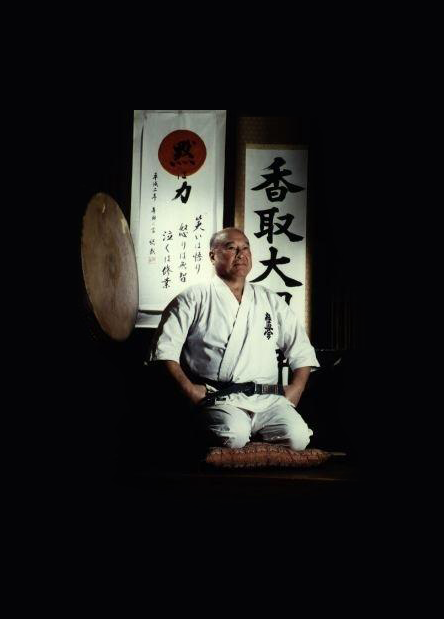 Mas Oyama did not only create an extremely effective martial art but he also gave us the Kyokushin way of life philosophy. It can be argued that he was one of the best karate master of all times and he made many great instructors who helped to spread his organization all over the world. He left us a legacy to be proud of. Osu!